On November 7, 2009, Diane Benedetti was arrested for Operating While Intoxicated. On November 9, 2009, the State formerly charged Benedetti with Operating While Intoxicated, as a Class C misdemeanor in Floyd Superior Court 2. Sitting Judge Glenn Hancock recused himself from the case, and on November 24, 2009, Special Judge Frank Newkirk, Jr. accepted jurisdiction over the case. In May 2010, a two-day jury trial was held in front of six jurors. After deliberation, the jury was deadlocked three to three and a mistrial was declared. 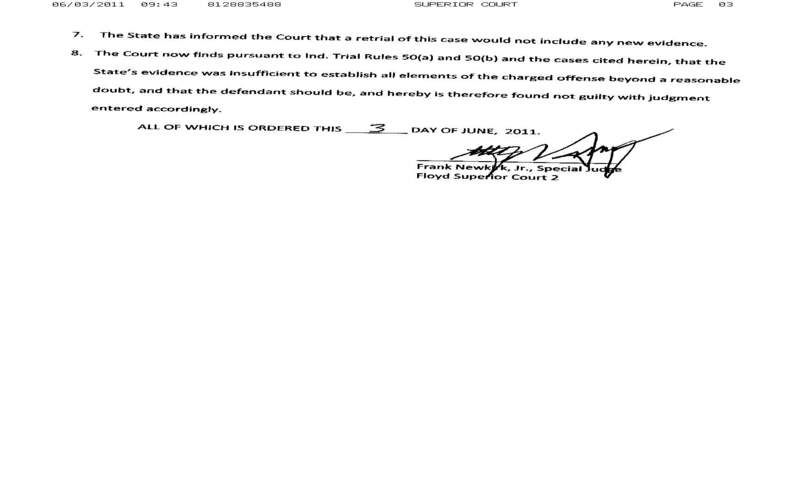 The State immediately informed the Court and the defense of its intention to re-try the defendant on the same charge. Benedetti’s case was set for re-trial on June 7, 2011. 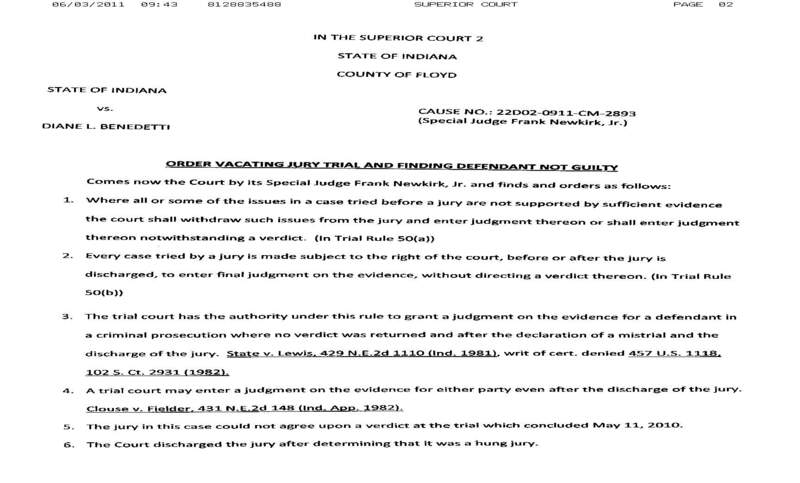 Without prior notice, the State was informed of the Court’s planned intentions regarding the case via conference call on June 2, 2011; the State received a formal order from Judge Newkirk on June 3, 2011 finding the defendant “Not-Guilty.” This order effectively denies the State its opportunity to present evidence in front of a jury. By law, the Indiana Attorney General’s Office handles all appeals for Indiana prosecutors. The State has formally requested for the Indiana Attorney General to review this matter for appeal. Click on the images below to read the order.